Have suggestions for products that you’d like to see reviewed by our real estate technology expert? Email him at craig@inman.com. When I started this column, I did so with the intent of wanting to create awareness about what’s out there while adding insight about perceived value. Even better if a few features here and there stand out. Yet I want readers to know that there is more to investing in real estate technology than just the product’s feature set. For a true partnership to exist, it helps to understand how your potential vendor partner approaches the product and an industry’s needs. Is the vendor offering just a few real estate-oriented modifications of an existing product? Like an Audi badge on a Volkswagen chassis. Or was there true intent to use technology to enhance how you do business? In Realvolve, I see a team, and a product, that puts a great deal of value in relationships. And what’s more critical to a real estate agent? 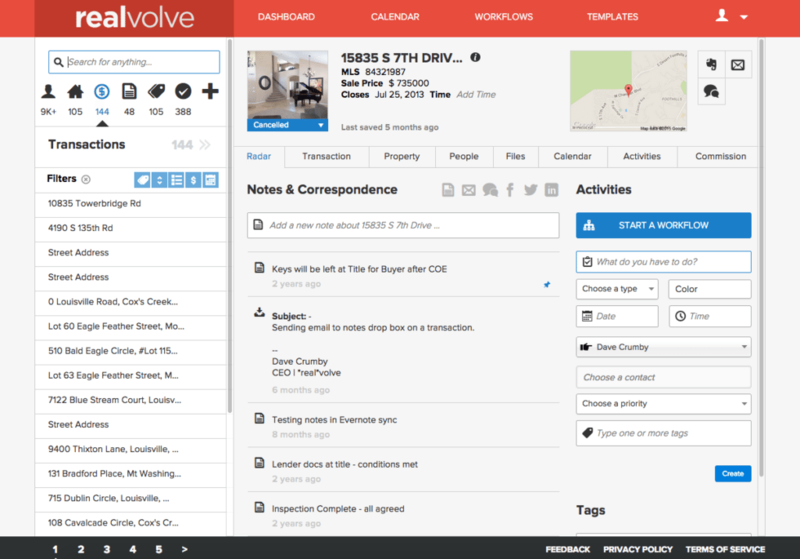 First and foremost, Realvolve comes across as a software company, not a real estate software company. This is important because it means they spend a great deal of time finding out how to solve problems. I’ve sat for hours, mouth agape, in programmer meetings watching them dissect issues as vexing to me as string theory so I could emerge with a marketing slant of some kind. Still, through the haze of jargon, it’s easy to recognize the effort to take a complicated challenge and use code to offer a simple solution. It’s in the nature of a programmer to want to take down walls or find tunnels through them. Programmers are true creatives, and it’s fascinating to watch. I’ve not been privy to a day in the office at Realvolve, but I’m sure I’d witness the same type of discussion on matters like connecting Evernote folders to a specific client. Or how to best integrate a very innovative tool like Zapier to assist in workflow automations. Sorry for the cliche, but that’s thinking out of the box. And it’s thinking about real estate agents. You multitask, you multidevice, and you multiply your contacts. Realvolve synchronizes that multitude of communication tools and methods to assemble them neatly into a smooth, efficiency-driven workspace. For features, there are many you’ll be familiar with, like a contact management module that enables you to monitor social media feeds, assign documents, track lead origination, and actively communicate via email, text and social media direct messaging. 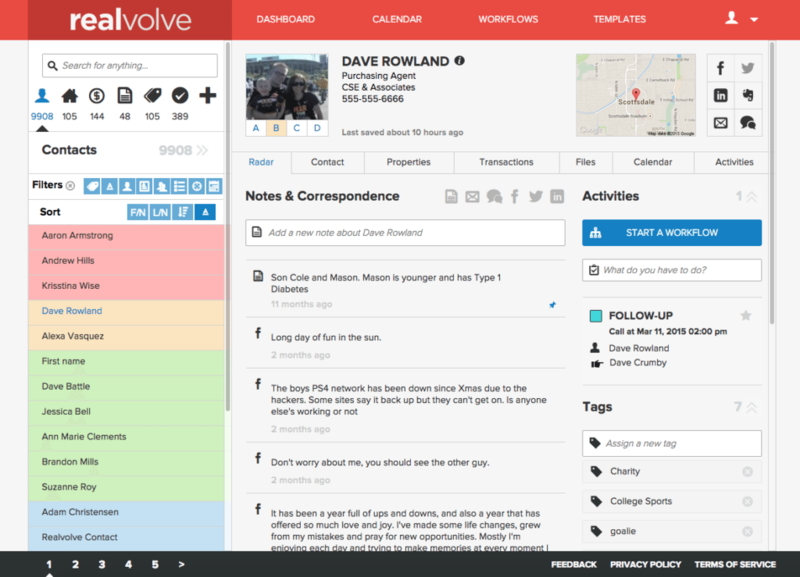 Realvolve also includes a nice calendar tool, task management capabilities, and a sharp tagging system that is searchable systemwide. So any file, note, property or contact can be found quickly. I see Realvolve as a workflow engine with CRM (customer relationship management) capabilities. You can add properties, for example, around which you can manage a market progress from listing to close. Since getting the business is different from doing the business, I ultimately see the CRM and workflow capabilities as separate entities of a single system. And considering the pricing, that’s a lot of intrinsic value. “Radar” is the clever and very apt name assigned to the Realvolve component that encapsulates your most pertinent communications per listing, transaction and contact. It’s sharp, a nice bit of quick-glance accessibility. I’d be remiss if I didn’t note how good-looking Realvolve turned out. This is important. Visual interaction is a powerful component of user experience. There’s a reason why you get sticker shock when the local marketing company quotes you $4,500 for a new logo. Can your nephew do it in Microsoft Word? Sure. But rest assured, your sister’s will be the only fridge it decorates. Point is, when you’re dealing with this much information, how it’s organized and presented is crucial. Where will your eyes lead? What deserves the most screen real estate? All crucial stuff that Realvolve gets right. Will Realvolve land you more listings? Maybe; it does help you manage those you have now quite a bit more effectively. It also looks great, doesn’t cost much ($67 per month for up to five users/10,000 contacts), and is sure to grow more appendages of efficiency. Might want to be around for that. 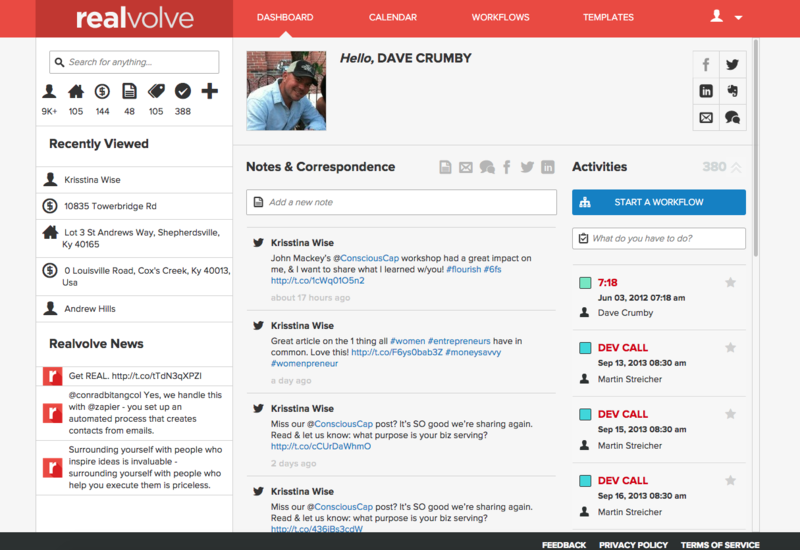 I think Realvolve does more than help you manage contacts; it helps you manage people. Sound hokey? Maybe. But would it sound that way to your clients? Do you use Realvolve? What do you think? Leave a comment and let us know!